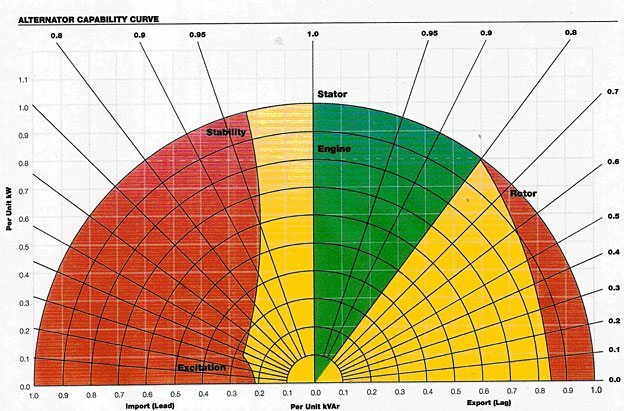 Alternator capability curve - Green area is normal operating range of a typical synchronous machine, yellow is abnormal but not damaging and operating in red regional will cause damage or misoperation. Let us consider that there is a captive diesel generator the rating of which is specified as 1000kVA and PF 0.85. Rating in kVA specifies the maximum current the alternator can deliver at the system voltage. In the previous parts of this article we have seen that the role of power capacitors in improving the power factor and reducing total cost of electricity in an industrial installation is well established with regard to supply of power from the Utilitys/utilities. Hence it seems logical to extend the above application of power capacitors when power is drawn from captive diesel generator to optimize their performance. Apprehension that the DG set may get over loaded due to the fact that the kVA rating or current delivered by the DG set is generally considered as the indicator of output of DG set. It is well known that use of capacitors will reduce the kVAR requirement from DG and hence kVA requirement will go down which in turn will reduce the current drawn from the DG set and could thus tempt the to add more loads on a given DG set. The other reason for such an opinion is related to the risks arising due to sustained leading power factor conditions that would occur with the use of fixed capacitors in variable load situations. However with meticulous application of PF correction capacitor we can improve the overall efficiency of DG set operation and result in considerable economic benefits to the DG set user. This article tries to analyze the same in the following paragraphs. As we have considered 1000kVA DG. This way of specifying the DG rating is very logical because specifies the maximum current the alternator can deliver at the system voltage. To find mechanical power rating of a diesel engine for a particular diesel generator, first convert kVA to kW and thereafter kW to BHP. This can only be done if we assume a certain average Power Factor (PF) under which the DG set would operate. The power factor so assumed should be in line with the average power factor prevalent in the industry. A typical industrial load comprises of induction motors (typical PF of 0.8 to 0.85), non-linear loads (typical PF of 0.5 to 0.6) and combination of unity PF loads (Resistive heating and incandescent lighting). Hence assuming an average power factor of 0.85 for typical industrial loads is considered acceptable by convention. Consequently a power factor of 0.85 is used for calculating the kW, which is then converted to the BHP rating of the prime mover. BHP rating so obtained is the output of the prime mover. Considering suitable engine losses it becomes possible to calculate the power rating of the engine. Now after understanding the DG set name plate rating parameter, let us come back to the question should we connect the Capacitor Banks in parallel to the loads conned to DG? Answer is YES, It is however, important to ensure that under actual operating conditions the kW loading and current loading should not be exceeded. Power Factor of loads supplied by DG sets can therefore be improved closer to unity by use of suitable Reactive Power Compensation Systems keeping in view the rated current loading is not exceeded. ** Any industry has a 1000 kVA DG set which is loaded at an average of 600 kW at 0.7 PF. In addition, there are 125 kW of other loads within the same installation, which are not loaded on the DG set due to capacity restrictions that arise during occurrence of short-term peak loads, such as motor starting, and intermittent welding load. Due to this, productivity in the Industry is lowered when the DG Set is in operation. During the period when Utility supply is available all loads can be operated. Is it possible to improve productivity when DG Set is in operation? ** A well designed power factor correction capacitor bank panel can improve the cost of electricity consumed from utility as well as improve productivity when DG Set is in operation. Hence one can see the moment capacitor bank is connected in parallel to the loads connected to the DG the additional requirement of 125kW is comfortably met without exceeding the percentage loading on DG. During the period when the Industry is using supply from the Utility the Capacitor banks system can ensure consistently high PF, thereby achieving demand savings and reduction in losses and elimination of any PF penalty. Consequently, cost of electricity consumed from the EB will be minimized. The same Capacitor banks system can be also used when the Industry is using supply from the DG set. The fast acting property of the Capacitor banks system will reduce the peak load requirements that are to be met from the DG set. This is achieved by providing instantaneous compensation from the Capacitor banks system during conditions when motors are started and / or welding machines are being operated. This will enable the Industry to transfer the 125 kW of additional load on to the DG set and ensure that productivity is improved when the DG set is in operation. Due to better loading, the DG set efficiency will improve as for same 857 kVA; Active power now delivered is now 728.45 kW instead of 600 kW. REACTIVE POWER COMPENSATION SYSTEMS by Capacitor Banks can enable D.G set users to reconfigure their loads / D.G sets to achieve better percentage loading and efficiency on the machines. As a result reduction in cost / kWh can be attained. Now since we have very well established that a suitably designed Capacitor Banks can be connected in parallel to the loads connected to DG. However what is the impact if one keeps on improving the power factor and the power factor goes on leading side. Some inherent characteristics of an alternator limit the amount of leading kVAR that can be absorbed by a DG. We cannot go on switching ON the Capacitor Banks as and when required, this can create over voltage condition in DG and subsequently over fluxing. There is a reverse kVAR limit of every generator. The ability of any generator to absorb the kVAR is termed as reverse kVAR limit. This ability is defined as reactive capability curve. Below figure shows typical generator reactive capability curve. X axis is the kVAR produced or absorbed (positive to the right). Y axis indicates the kW (positive going up). kVAR and kW are shown as per unit quantities based on the rating of the alternator (not necessarily the generator set, which may have a lower rating. The normal operating range of a generator set is between zero and 100 percent of the kW rating of the alternator (positive) and between 0.8 and 1.0 power factor (green area on curve). The black lines on the curves show the operating range of a specific alternator when operating outside of normal range. Notice that as power factor drops, the machine must be de-rated to prevent overheating. On the left quadrant, you can see that near-normal output (yellow area) can be achieved with some leading power factor load, in this case, down to about 0.97 power factor, leading. At that point, the ability to absorb additional kVAR quickly drops to near zero (red area), indicating that the AVR is “turning off” and any level of reverse kVAR greater than the level shown will cause the machine to lose control of voltage. A good rule of thumb for generators is that it can absorb about 20% of its rated kVAR output in reverse kVAR without losing control of voltage. However, since this characteristic is not universal, it is advisable for a system designer to specify the reverse kVAR limit used in his design, or the magnitude of the reverse kVAR load that is expected. Note that this is not specified as a leading power factor limit, but rather as a maximum magnitude of reverse kVAR. We are more often in DG products being exposed to fast response time issues of drives connected to Genset’s, in addition to the inherit harmonics of the drives. An application that has a drive require a stiff line ( low impedance) will not work on a Genset ( high impedance), and cause large frequency / voltage variations or even stall the Genset. Given that the typical power factor of the drives and today’s LED lighting loads are already in the area of 0.95, is there a way to mitigate the extra current capacity issue by adding AC correction capacitors only for the purpose of allowing for this typical operation scenario ( peak current demand on CNC drives, causing voltage and frequency dips on genset). I would suspect a combination of reactor and capacitor would be required pf tuned circuit of some type. Currently I don’t have a real solution outside of the drive package ( 2 x CNC lathes). On the DC bus side adding additional capacitors can fix this issue with a DC bus choke, but leads to other issues on the rectifier input sizing and voiding of warranties in the new CNC lathes. Please help to understand advantages and disadvantages of HT APFC and LT APFC. Kindly help me with the comparison. what is the main criteria to segregate capacitor bank in APFC panel? 1. We request you to please clarify a doubt we have regarding Capacitor installation when running our Generators to ensure their long smooth life. 2. When we run our Gensets individually, we are getting a Power Factor of 0.55 and 0.65 for our 250 KVA and 365 KVA Gensets respectively. 3. An Electrical Engineer advised us to install a 90 KVAR Power Capacitor and an Automatic Power Factor Control Panel to get a PF of 0.85 for our existing load, to improve the Power Factor when running on Gensets. 4. Alternately, another Electrical Consultant advised us that there will be extra load on the Alternators during operation if big Capacitors are installed in the Power Factor Control Panel; rather to use smaller capacitors at the motor, which we will operative only during Delta running of the motors. We have installed a 15 KVAR Capacitor for our 40 HP motor and another 12.5 KVAR Capacitor for our 30 HP motor, only during Delta running. This has improved the Power Factor on our Generators from 0.65 to 0.72. 5. Please excuse our lack of technical knowledge, in case we have not explained the problem correctly. We are confused about two opposite views. Please guide us regarding the correct procedure for Capacitor installation, to ensure a long smooth life of our Gensets. just practice – it is an usual mistake in in what was assumed. The Generator has its own power factor and usually you found it on the nameplate, and should be around 0.8, and should not to be compensate. In order to avoid loosing power, uncontrolled voltages, and high inductive currents that a regular switch/disconnector could not manage, what one have to compensate is the power factor at the load. Just measure it and add sufficient inductance or capacitance (as in the case) as the PF at the load to come into the 0.8-1 interval. Than, you could use mains or any kind of generator, the power factor would be the same. What would happen if APFC panel is connected only at HT side of the supply instead providing at LT side ? there are 2 capacitor bank installed in plant substation. DG is also beside the substation.i am finding different reading of pf on these capacitor bank panel say for one its 0.78 while for other its 0.87. why is it so? what is significance of two bank and their difference in pf? We are having 250 kva Dg Sets, but it shows over current alarm, also overheating when loaded..? Why we should turn off all the capacitor manually when voltage is beyond 440volts and turn on all the Capacitors of Capacitor bank when voltage drop to 380volts. First check PF of individual transformer on HT side ideally it should maintain unity. Where you observed this 0.5 PF. If it is combine effect of both transformer on the HT side then switch off the primary supply of TR2 transformer which is you aready switched off. After this your probem still as it is, then provide your plant SLD. kindly confirm me, if we have certain type of load on our 600kva generator and we want to calculate its P.F before going to install capacitor bank, how we can calculate the P.F ???? It is the load which lowers the power factor of the power delivering system. When power is drawn from utility, it is desirable to improve the power factor to unity. But when the power drawn from the DG Set, the power factor is not allowed to be improved beyond 0.95 as recommended by the DG set manufacturer. Also after the DG set is started, the load is increased on it gradually. While the load is less and if a fast switching APFC system is connected to it for PF correction, due to capacitor connection the DG set runs overexcited and starts hunting. These specific requirements does not allow the customer to use the same APFC system with DG set that is in use while power is drawn from utility. The customer needs to have two different APFC systems i.e. one for using on utility and other one for DG set, calling for additional investment. Gen Master comes with the APFC relay with duel setting. The customer can preset the target power factor that is to be achieved while using DG set or utility power. Customer need to preset it only once and leave it to the controller to achieve the target PF. The controller target power factor setting automatically changes over to another setting whenever power fails and load is transferred from utility to DG Set. The APFC relay that comes with Gen Master has the program not allowing to switch on the capacitor banks until the load on DG set loaded upto 15-20%. Please refer the previous parts of this article for diagram of kVAR and kW. Concept of reverse kVAR states that when you pf is lagging your synchronous machine (here DG) will give required amount of kVAR. When you improve the pf (but still on the lagging side) that is from o.8 lag to 0.95 lag than the machine is relieved of supplying the kVAR equal to (kVAR corresponding to 0.8)-(kVAR corresponding to 0.95). Now when you further improve it and pf goes to leading side than instead of drawing the reactive power from the machine you are supplying back the reactive power to machine. 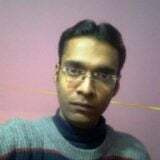 How much amount of reactive power you can supply back to machine that is what is maximum possible leading pf of the load which any synchronous machine can tolerate without loosing control of voltage is limited by reverse kVAR limit of machine. One sample characteristic is indicated in this article. Yes you are correct we should always use APFC panel for pf improvement when supply is from DG so that only that much number of capacitors are switched on as much is required for improvement of pf and we do not get any leading pf condition. It is because of variation of load that we do not go for fixed compensation but variable compensation which is achieved by APFC relay in APFC panel having capacitor banks in steps and not one single large unit. I hope points are clarified now. If not please let me know. The diagram for KW and KVAR is not shown here. The concept of Reverse KVAR is not very clear. Why can we use APFC panel in case of DG sets as we use in utility system? The variation of load can happen in normal system also that will lead to leading power factor? Please explain. Also for importance of reactive power in any power system please refer the article by Mr Jignesh parmar in EEP. If you don’t mind can you explain using capacitor bank and shunt reactor at sub-station.For efficient using.